"Persons of distinction who have contributed to the advancement of intravenous anaesthesia are eligible for election as Honorary Members on the nomination of the committee"
Dr Iain Glen has been a member of the UK Society for Intravenous Anaesthesia since its inception in 1997. 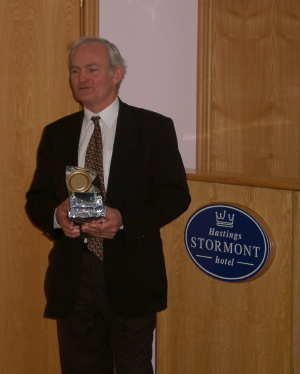 He has made a unique contribution to Intravenous Anaesthesia, and it was the unanimous view of the SIVA UK Committee and the Members present at the AGM in Belfast that he should be the Society's first Honorary Member. 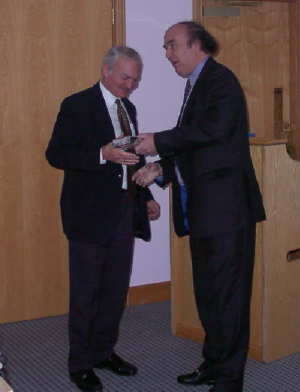 Honorary Membership was duly bestowed on Dr Glen by the SIVA UK President, Dr John Sear, on Friday 24th November 2000. Dr Glen was born and educated in the West of Scotland, and graduated Bachelor of Veterinary Medicine & Surgery from the University of Glasgow in 1963. After working as a Veterinary House Surgeon at the University of Nairobi, he returned to Glasgow and was appointed Lecturer in Veterinary Surgery, with an interest in Anaesthesia. He began to study the utility and clinical pharmacology of new anaesthetic, sedative and analgesic agents, including ketamine, neuroleptanalgesic mixtures, xylazine and Althesin. He was granted the Diploma in Veterinary Anaesthesia (RCVS) in 1968, and awarded a PhD by the University of Glasgow for his thesis "Studies on the pharmacology of injectable anaesthetic agents" in 1982. In 1972 he moved to the Research Department at ICI Pharmaceuticals as a research biologist in the Anaesthetics Project Team. The objective of this team was the discovery of novel anaesthetic drugs for use in man. In 1973, he selected 2,6-diisopropylphenol (propofol), which had a promising profile of activity and continued more detailed evaluation. During his time in the Research Dept he advised on strategy for the clinical evaluation of propofol, and in 1983 he transferred to the Medical Affairs Dept within ICI to assist with the clinical trial programme required to obtain regulatory approval for the drug. 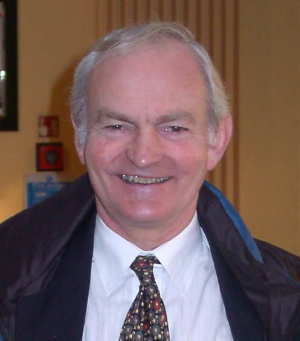 Iain Glen was responsible for the design, supervision and reporting of a number of the studies in the regulatory programme. A major factor contributing to the delay in development and approval was the difficulty in finding an appropriate aqueous formulation for propofol, which is highly lipophilic. An aqueous emulsion formulation incorporating soyabean oil was preferred and this was launched in 1986. 'Diprivan' became the leading product, by value, in the human anaesthesia market. Propofol is also marketed as ‘Rapinovet’ for use in veterinary anaesthesia. 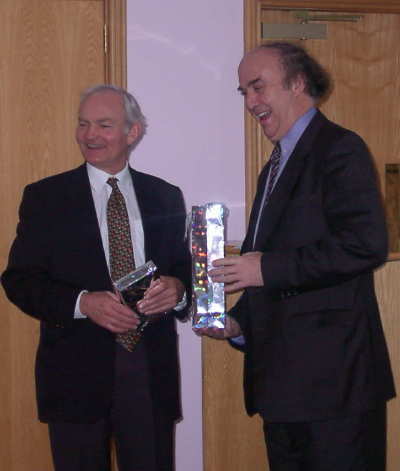 Following the launch of Diprivan in 1986 Dr Glen devised and co-ordinated a post-marketing clinical trial programme. It became clear that infusion anaesthesia with Diprivan was associated with rapid clear-headed recovery and a low frequency of postoperative nausea and vomiting. A small number of academic centres had begun to develop and evaluate computer controlled administration techniques for iv anaesthetic agents, and in 1990 Dr Glen hosted a meeting of international experts with an interest in this area at ICI (later Zeneca) Pharmaceuticals. He became personally convinced that this technique could greatly simplify the administration of Diprivan. In 1992 he organized a second meeting on ‘Target controlled titration of anaesthesia’ at the time of the 10th World Congress of Anaesthesia at the Hague, and about 60 international delegates attended. The interest in this area was increasing and by 1993 a decision was made within Zeneca to support the commercial development of a Target Controlled Infusion (TCI) system to facilitate the administration of Diprivan. One academic group working in this area was led by Dr Gavin Kenny of the Department of Anaesthesia at the University of Glasgow. Zeneca negotiated with the University and in 1994 agreed to licence certain intellectual property rights relating to the use of the TCI system developed by Dr Kenny and his associate Dr Martin White, for the administration of propofol. The production of a commercial system required a major development effort within Zeneca. Dr Glen's principal responsibility was in the area of clinical trials but he also had a coordinating role, particularly in the areas of the assessment of device delivery performance and collaboration with pump manufacturers. Zeneca received a Queens Award for Technological innovation for Diprivan in 1994, and ‘Diprifusor’ TCI was launched in the UK market in September 1996. Regulatory approval has now been obtained in approximately 25 countries throughout the world. Dr Glen retired from his post as Clinical Specialist in Anaesthesia at AstraZeneca Pharmaceuticals on 31st October 2000, and now heads an Independent Pharmaceutical Consultancy, Glen Pharma Limited. He was admitted to the Fellowship by Election at a meeting of Council of the Royal College of Anaesthetists held on 20th November 2002. "I would like to convey to the SIVA UK committee my sincere thanks for their kindness in granting me Honorary Membership of the UK Society for Intravenous Anaesthesia at the recent meeting in Belfast and for the generous presentations made at the meeting. This unexpected honour is much appreciated and I am delighted to be the first such member in the Society. As I said in Belfast, working with propofol has given me the opportunity to meet a great number of dedicated and enthusiastic anaesthetists both in the UK and overseas. This collaboration has been both productive and enjoyable and I have made many good friends within the profession. As you know, I am planning to maintain some involvement in anaesthesia and hope I will be able to continue to support the activities of SIVA UK. I thought the Belfast meeting was very successful and provided good evidence that the Society is going from strength to strength. With best wishes for the future prosperity of the Society"